Linda was born July 25, 1947 in Kingsley, Iowa to Charlton and Sylvia ‘Dragoo’ Richards. She was raised in the area and graduated from Kingsley-Pierson High School in 1965. On April 8, 1967 Linda married Roger Revis. After their marriage the couple lived in Spencer, IA., Filley, NE. and finally Fremont. Linda was the secretary at the Arlington Community Church, then the Coordinator for the John C. Fremont days for 18 years before becoming the Sarpy County Director of Tourism. She retired in October 2017. 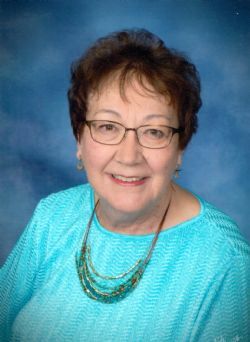 Linda was involved in many things including the National T.T.T Society, Nebraska Tourism Council and was a member of First Lutheran Church in Fremont. Her greatest love was her family and grandchildren’s activities. 5 grandchildren – Cameron and Alicia Ringer, Alec Cooley, Myia and Kallie Johnson. Sister - Elaine Todd of Kingsley, IA. Sister-in-law – Audrey (Dr. Michael) Peery of Michie, TN. Brothers-in-law – Dennis Revis of Winterset, IA. Rodney (Jackie) Revis of Spencer, IA. Linda was preceded by her husband Roger in 2013, a brother Larry Richards and her parents. The funeral will 10:30am Wednesday, First Lutheran Church (3200 E. Military) with the Rev. Stephanie Tollefson officiating. Burial will be in Ridge Cemetery. Memorials directed to the family.